The world of online gambling is getting increased popularity among the gamblers of the world. More and more people are opting for the online version of gambling. Brick and mortar casinos are still very popular – but online casinos are picking up the pace. That being said, there are several game-developer studios that are responsible for this rise in popularity of online gambling. There are the classic names of Microgaming and NetEnt. But if there is one name that continues to stand out in the sea of mediocrity – it’s Betsoft. If you want to learn more about this company, then you have come to the right place. Below you will find all the information you’ll need on the subject of Betsoft. Betsoft was originally founded back in 1999. It had a slow start initially as very few casinos were using its services and products. However, with the dawn of the new millennium, there came immense progress in the computer technology. The speed of the internet also increased tremendously at the time. And this made online gambling a much more viable option for gamblers all around the world. So, many new online casinos wanted to spice things up and introduce new games from new creators. Betsoft took the chance and made it to some of the leading casinos of the day. But things really started to go up for Betsoft in 2008 when they have developed their Slot3 games. These were visually impressive for the day and they used 3D technology. In fact, many people said that the graphics were on par with those made by leading Hollywood studios. And one of the best things about these Slot3 games were the bonuses. There were many exciting and novel bonuses that players could get while playing these games. This made the popularity of the Slot3 games and Betsoft itself skyrocket. Mobile gaming is a relatively new field that has drawn millions of people recently. And Betsoft entered the field back in 2012 when the field was still very young. Betsoft has introduced their critically and commercially acclaimed ToGo series of games. These were compatible with the mobile phones at the time. They featured supreme graphics and features and they quickly became very popular. Betsoft hasn’t really received many rewards during its rich and very deserving history. However, some of the providers that used Betsoft’s services have gotten many rewards. One operator that used Betsoft’s services received the coveted EGR Magazine award. Another operator received the award of Slots Operator of the Year. And as time goes, we can only expect that Betsoft itself will be the proud recipient of many rewards. Betsoft’s games are all legit. To this end, Betsoft has created a special Random Number Generator (RNG). This generator creates long random strings of numbers that ensure that the results of the games are random. Betsoft even goes so far as to employ some of the best mathematicians in the field of gambling. requently check up on Betsoft’s games in order to see if they are legit. And they have ended issuing a certificate that guarantees that Betsoft’s games are 100% fair. Also, the Licensing Authority of Curacao has issued a license for Betsoft’s games. This further guarantees that the games are fair. The Licensing Authority of Curacao is a highly-respected regulatory body in the field of online gambling. All this means that you should have no worries about the fairness of Betsoft’s games. This company has created a number of different popular games. They do seem to respect the quality of the games over their quantity. They didn’t rise to the level of some of the studios that have released over 600 games. But every single one of Betsoft’s games is all but a perfection. Betsoft’s game creators place tremendous focus on every detail of every game that they make. And so, they release fewer games and a bit more sporadically. However, the quality of every game that they make cannot be denied. That being said, one of the types of games where Betsoft really made a name for itself is slots. And to be more specific – 3D slots. The graphics of these slots, designed by Betsoft, are a thing of beauty. Again – they are on par with the graphics made by leading Hollywood studios. Your imagination will be captured by what some of these games have to offer. Moreover, the soundtracks are all close to perfection. Betsoft works with some of the biggest names in music in order to create perfect soundtracks for their games. As for the games themselves, the most popular ones come in the Slot3 category. Some of these games are Dr. Jekyll and Mr. Hyde, 2 Million B.C., A Night in Paris, Greedy Goblins, and many others. When it comes to the ToGo category, some games are It Came from Venus, Good Girl Bad Girl, and At the Coppa. 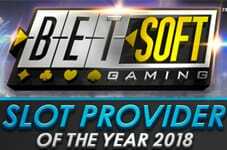 All of the above goes to show that Betsoft is one of the leading names in the field of online game development. And who knows what the future holds for this company? Given the fact that they are more about quality than about quantity – the future looks bright. They will undoubtedly create dozens of new games that will be worthy of praise in the near future. And the fact that they adhere to the fairness of the games makes playing their games even more worthwhile. That being said, we hope that you too will enjoy playing some of Betsoft’s unique, fun games.